HEADLANDS: When the riot police arrived, Zimbabwean farmworker Mary Mhuriyengwe saw her life fall apart as her job and home disappeared in the ruthless land seizures that defined Robert Mugabe’s rule. Mhuriyengwe, 35, watched as police carrying AK-47 rifles released teargas to force white farmer Robert Smart off his land in June 2017 — perhaps the last of 18 years of evictions that helped to trigger the country’s economic collapse. To her shock and amazement, Mhuriyengwe is now back at work on the farm and back living in her modest house, after Mugabe was ousted in November and Emmerson Mnangagwa became president. 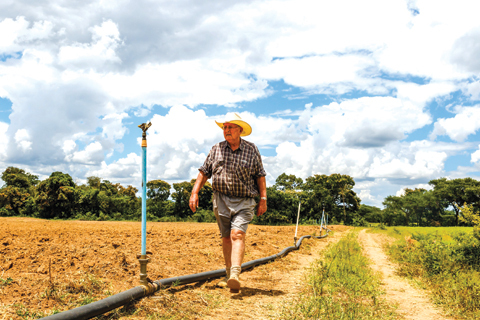 Smart was allowed to return to his farm within weeks of Mnangagwa’s inauguration, becoming the first-and so far the only-white farmer to be given back his property. But it is far from certain whether Smart’s case will be a precedent enabling other white farmers and their employees to return. Smart’s farm had been at the centre of a power tussle within the ruling ZANU-PF party involving a close ally of Mugabe-whose sudden fall from power saw the property quickly returned to its owner. Mnangagwa himself has described Zimbabwe’s land seizures as “irreversible”, and stressed that white farmers would not get their old land back. Instead, they are being encouraged to take other farms on new 99-year leases as the government seeks to boost the agricultural sector to revive the moribund economy and create jobs. Evicted white farmers may also receive cash compensation-but where the money would come from is unclear. Zimbabwe’s often-violent land reform program started in 2000, with thousands of farmers forced off their land by mobs or evicted. Mugabe said the reforms would help black people impoverished by British colonial rule. But critics blame the land redistribution for the collapse in agricultural production that led to Zimbabwe’s economy being wrecked by hyper-inflation, mass unemployment and emigration. Many of the seized farms were given to Mugabe’s loyalists or fell into disrepair. Now other white farmers and their employees are waiting to see if Smart’s case offers them any hope. “There might be changes in future but as things stand, there is absolutely no change,” former cattle rancher Mike Clark told AFP. Ben Gilpin, director of the Commercial Farmers’ Union, said he was not aware of any other farmers yet allowed back on their land. Whatever the fate of other farms, Mhuriyengwe smiled as she watched a tractor leaving the shed to plant a potato crop. Smart has already recalled 40 of his 300 permanent and casual workers, and has prepared the first five hectares of his 120-hectare farm for potatoes. “It pained us when Mr Smart was evicted and we were ordered to leave,” said Mhuriyengwe who was among families forced to seek shelter in nearby mountains.